Will Jianyu Lu is a Kellogg dissertation year fellow and doctoral student affiliate who studies economics with a focus on development, trade, and macroeconomics. His current research, which he describes below, studies the impact of transportation infrastructure on firm dynamics in China. He is also working on another project analyzing the relationship between labor market flows and development. His previous work includes a study on the relationship between firm productivity and liquidity management in the presence of financial frictions. Your current research project, which is part of your dissertation, explores China’s National Trunk Highway System (NTHS), a massive and fast-growing road network that connects the country’s major metropolitan areas and its more rural periphery. Can you explain how, from a trade perspective, this is changing the country? Although the main objective of this highway system is to connect all provincial capitals and large metropolitan cities with the nation’s capital in a single network, peripheral areas between the targeted cities inevitably become connected. Better roads lower the trade cost between places, increasingmarket access of firms in peripheral areas and also introducing competition from larger cities. Since these are opposing forces, which effect dominates has been a policy question of great interest. Using a novel econometric technique, I find that the causal effect of the highway system on growth is positive. Firms connected by the NTHS grow faster thanks to cheap inputs and access to foreign machinery. Is there a central question that motivates your research on the NTHS? The central questions that I want to address are: What are the effects of building transportation infrastructure on growth? In particular, how does building new roads affect the productivity of manufacturing firms? Transportation infrastructure is crucial for development and is one of the most expensive investments in the world, and understanding its effects is essential so governments know how to direct their resources. I chose to study China’s NTHS because it is the largest highway infrastructure in the history of the world and also because China has experienced the longest sustained growth. Your goal with this project is to learn more about firms that are negatively affected when they become connected to other markets. So far, you’ve found that connection to the NTHS hurts small young firms outside the targeted metropolitan areas. Why are those businesses affected as opposed to larger and more established ones? Although I find that the overall effect of the NTHS is positive for firms’ growth, I discovered that older firms are driving this result. The net connection effects for younger firms, given that they existed before the highway was built to connect them, is negative. The results suggest that these firms cannot take advantage of all the benefits created by better roads and that they are severely affected by competition. In addition, since I also determined that firm size or access to credit cannot explain the age effect, it is suggestive that there is complementaritybetween firm-to-firm network and transport infrastructure.While older firms have developed networks of suppliers and customers that can expand with better roads, younger firms face tougher local and external competition. You’re from China but grew up in Argentina. How has your background influenced your academic interests and work? My diverse background heavily influences my desire to understand why some nations are able to develop at a fast pace while others consistently lag behind. I have been interested in questions including: What allows a developing country like China to grow its income per capita eightfold in the last 25 years? And how can resource-rich nations such as Argentina constantly fall into economic crisis and live in uncertainty? From my experience and witness, I argue that the answers to these questions lie in different government policies and infrastructure investments. So, I have become a macro development economist to study the impact of policies that affect economic growth. How are trade and transportation infrastructure relevant to the Kellogg Institute’s central themes of human development and/or democracy? 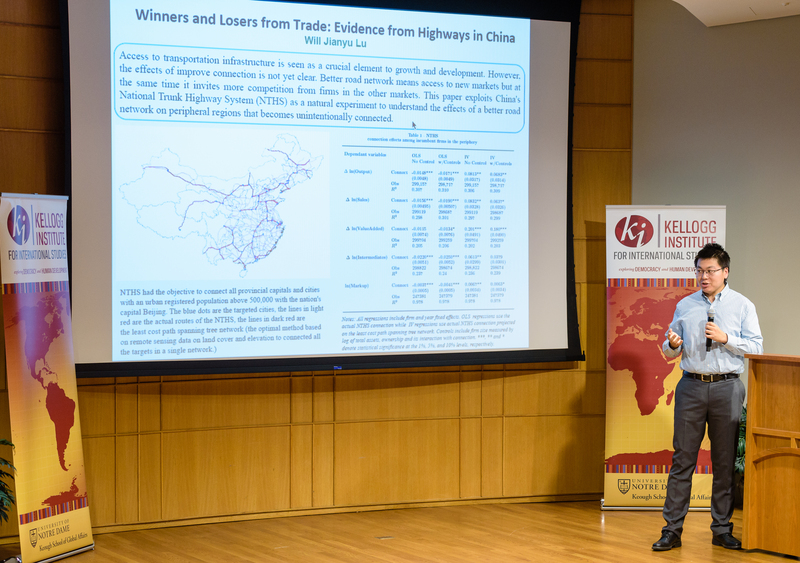 Trade and transportation infrastructure are key determinants of economic development, so evaluating and understanding their effects complements the Kellogg Institute’s research agenda promoting human development. A tremendous amount of capital is invested in transport infrastructure projects. However, governments and loan-granting international organizations, such as the World Bank, do not have sufficient evidence to optimally allocate the limited capital available. Therefore, it is important to focus on both winners and losers from trade because vulnerable people in certain types of firms can be harmed as a result of broad trade policies. What role has the Kellogg Institute played in your research and development as a scholar? The Kellogg Institute and its staff have provided me with immeasurable support and helpful feedback. Thanks to the Institute, I was able to attend workshops and conferences where I presented my work, learned skills, and networked with top economists in the field. With the Dissertation Year Fellowship from the Kellogg Institute, I can focus on my research and not have to worry about other departmental duties. In addition, Kellogg events are excellent opportunities to expose my work to people from other fields.